Do you use videos to enhance your brand? Want to find ways to grow your business? 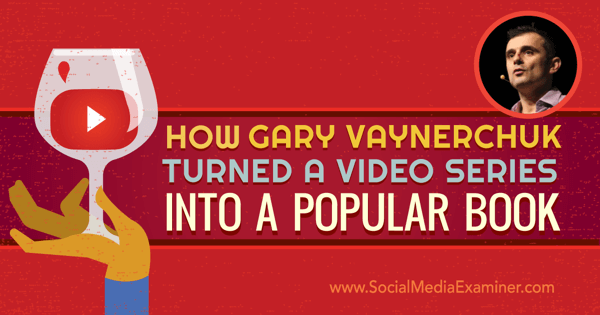 To discover how he created a video series that exploded his personal brand and his business, I interview Gary Vaynerchuk. In this episode I interview Gary Vaynerchuk, CEO of VaynerMedia, host of the #AskGaryVee Show and author of Jab, Jab, Jab, Right Hook. His brand-new book is called #AskGaryVee: One Entrepreneur’s Take on Leadership, Social Media, and Self-Awareness. Gary will explore how he created a video show that became an audio podcast and a book. You’ll discover Gary’s thoughts on what’s hot in social. 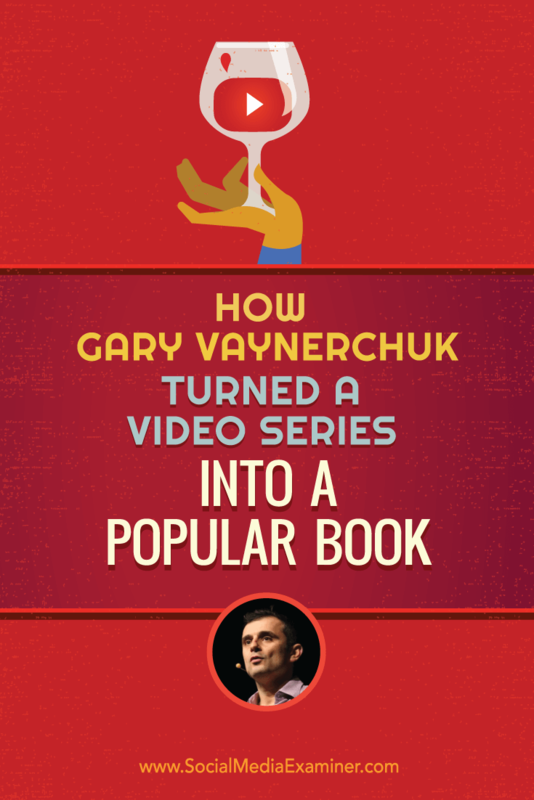 Listen as Gary Vaynerchuk shares how he turned a video series into a popular book. Gary recalls that from a business and entrepreneurial standpoint, he’s always dreamed big. At 14 years old, he started working for his dad bagging ice for $2 an hour and by his third day on the job was plotting how to open 4,000 wine stores. Although a lot of people think Wine Library TV grew his business, Gary clarifies that he’d been in business for over a decade and built a $50 million+ operation before he started Wine Library TV and talking about marketing. Gary launched Wine Library TV on February 1, 2006, which was less than a year after YouTube had been created. He says that while the show didn’t really pop until the summer of 2007, he felt there were enough comments to make it worthwhile. He notes that Ze Frank and Rocketboom were also making some noise around the same time. Wine Library TV was Gary’s first foray into video. Gary’s patience paid off and when he ended up on the Conan O’Brien Show, Lifehacker, TechCrunch, and Diggnation, everything exploded. Listen to the show to discover how and when Gary discovered he was good at being a personality. During the summer of 2014, D Rock (David Rock) emailed Gary, asking to make a film about him. Gary agreed and before the film even aired, Gary asked David to work for him full time doing video content. Then on a random day a year and a half ago, Gary invited David and Steve Unwin from his editorial team into his office to shoot the first episode of #AskGaryVee, in which Gary answered random questions people asked him on Twitter. When asked how the format for the show came about, Gary shares that he felt his keynotes were stagnating because he was telling the same story over and over. To get out of that rut, he started pushing event organizers to let him add a Q&A component to his presentations. For example, during a 45-minute keynote, he would do 30 minutes of speech and 15 minutes of Q&A. Gary believes his ability to answer any question about business, social media, technology, or branding off the cuff is what separates him from other speakers. Gary realized he didn’t need to travel to answer questions and he could use the video show to deliver something he was really good at. Then, he made the decision to use it to get to the point where his keynote speeches were solely Q&A sessions. Gary explains that the format for #AskGaryVee is simple. They go into an all-glass conference room at VaynerMedia, Gary sits down in front of the camera, and India asks him five questions that come from social media (Snapchat, Instagram, Facebook), which Gary answers in one take. Any edited spots, which are rare, go to black and white so they’re clearly recognizable. In addition to #AskGaryVee, Gary recently started #DailyVee, which is a day-in-the-life vlog that gets edited into episodes to help entrepreneurs who learn by watching people, instead of by listening to answers. Gary says he aims to publish two #DailyVee episodes and two #AskGaryVee episodes each week. Listen to the show to learn how Gary repurposes the #AskGaryVee video show for Facebook and his audio podcast. 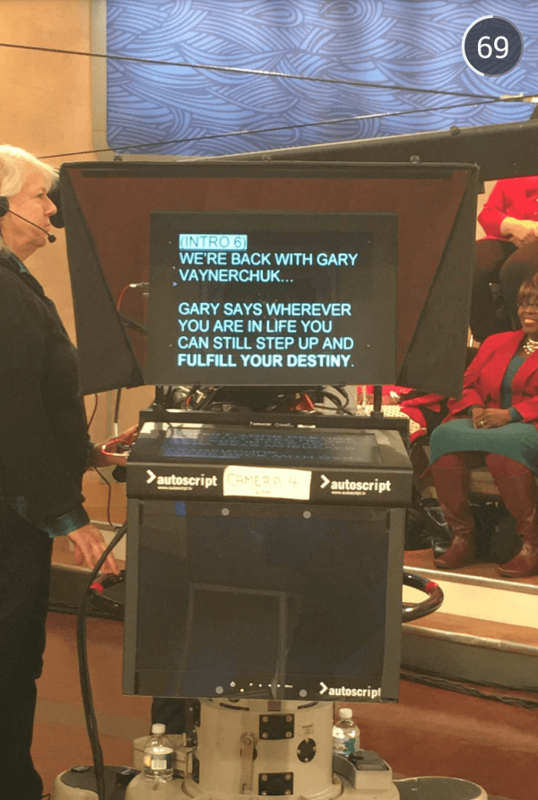 Gary clarifies that #AskGaryVee is not a straight transcription of the answers he’s given on the show. In the book, he says, he’s expounded on his original answers, added content, and included 150 questions. As someone who puts out micro-content all day long, Gary is excited at the depth of this book and feels that it’s (secretly) Crush It! 2.0. For the first time, he’s gone 360° on operations, work-life balance, and leadership. Gary adds that his ambition is for the book to be the modern entrepreneur’s blueprint. When asked how marketing this book differs from his previous releases, Gary notes that because he’s been doing a lot of personal branding through both his shows and on Snapchat, his fans are more engaged with him than they were with the releases of The Thank You Economy and Jab, Jab, Jab, Right Hook. He believes he’s jabbed his community so well for the last 18 months with free content and access, that there are going to be a lot of right hooks landed come March 8 when #AskGaryVee comes out. Listen to the show to hear how Gary feels about serendipity and why people should try new ideas. Gary remembers talking about Snapchat on the Social Media Marketing podcast with Shonduras a year ago. He says Snapchat is going through its big crossover moment, where it’s going completely mainstream. He believes it’s going to be right up there with Instagram because normal, everyday people like his brother-in-law spend four hours a day on the platform consuming content. Gary says that while Snapchat is confusing up front, when you figure it out, it has a YouTube–like environment. People can’t help but follow 17 different things (4 media companies, 11 personalities, 2 schools, 1 radio station), and they just love it. Gary explains that if you follow GaryVee on Snapchat, you’ll see he’s doing day-in-the-life-of-an-entrepreneur content, but is adding value with Snapchat secrets, in which he provides tidbits and ideas that will help others succeed. Gary says he does about 5 to 11 spontaneous snaps throughout each day. Gary shares a day in his life through his Snapchat snaps. Mike and Gary discuss the future hierarchy of social networks and the rank of Snapchat in particular. Gary thinks Instagram is a top network to watch, but predicts Snapchat will be rolling off the tongues of entrepreneurs, social media experts, pundits, and others at a surprising level. Gary shares that he’s also excited about Musical.ly, a platform like Vine or Instagram, where there’s music overlay and you can dub or act within the content, and AfterSchool, a high-school only social network with a blueprint similar to what we saw with Facebook. Listen to the show to discover Mike’s prediction on the future of Snapchat. Gary believes the excitement around live video is real and shares that although he’s an investor in Meerkat, he does most of his live broadcasts on Facebook Live and Periscope because that’s what’s best for his audience. While a lot of people can do Snapchat, Gary says, he doesn’t believe that to be true for live broadcasting. He explains that it’s very hard to keep an audience captivated in a live environment for a long period of time, and thinks most people are going to struggle with it. Listen to the show to hear why Gary loves doing live video and Q&As. Looking for a mobile graphics app that lets you go beyond basic square images and quote graphics? Adobe Post is a free iOS app from the makers of Photoshop and Illustrator that lets you create quality graphics from your mobile device. Adobe Post lets you save your projects, which is not a typical function for a mobile graphics app, and also connects to any Adobe Creative Cloud storage you use. Create awesome graphics with the Adobe Post app. Adobe Post has free high-quality photos you can use in your images and uses magic text, which means you can change the size and layout of your text quickly and easily by putting your finger down and dragging it. There are even some professionally designed templates available. Now you don’t have to be a professional designer to create quality graphics on the go. Listen to the show to learn more and let us know how Adobe Post works for you. You can now sign up for Social Media Marketing World 2016. It’s the world’s largest social media marketing conference. By attending, you’ll make connections with 100+ of the world’s top social media pros (plus 3,000 of your peers) and you’ll discover amazing ideas that’ll transform your social media marketing. Speakers include Guy Kawasaki, Mari Smith, Michael Hyatt, Jay Baer, and Michael Stelzner. Here’s a peek at what three other experts are presenting: Levi Bethune, the live-action director at Epipheo, will lead a workshop on video composition. He’ll cover lighting, lenses, aspect ratios, white balance, audio, codex, framing, hardware, software, and more. Jessica Howell, CEO of SocialStudioShop and a photographer with 10 years of experience, will share how to create amazing photos using just your smartphone. Joel Comm will be talking about how to create your own live video show with Blab.im. Learn from these experts and you’ll walk away with skills that make you a better marketer. The event takes place in San Diego, California on April 17, 18, and 19, 2016, and hundreds of people from more than 50 countries have already purchased their tickets. 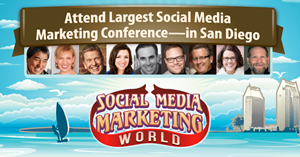 If you’ve heard about Social Media Marketing World, and always wanted to connect with leading experts and thought leaders, visit SMMW16.com. We have some great pricing going on right now. Click here to check out the speakers and the agenda and grab your early bird discount. 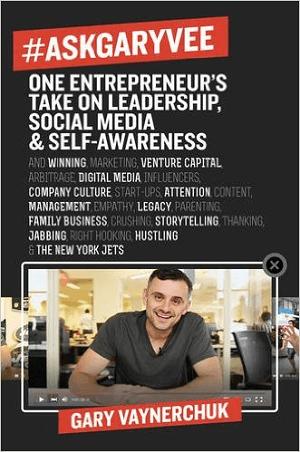 Learn more about Gary Vaynerchuk on his website and on VaynerMedia. Watch the #AskGaryVee Show and the #DailyVee. Read #AskGaryVee: One Entrepreneur’s Take on Leadership, Social Media, and Self-Awareness. 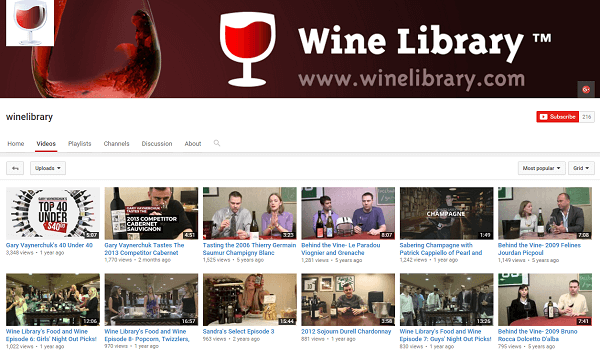 Check out Wine Library TV. Watch the video blogs of Ze Frank and Rocketboom. Check out Gary and Wine Library TV on the Conan O’Brien Show, Lifehacker, TechCrunch, and Diggnation. Follow GaryVee, D Rock, Steve Unwin, and India on Twitter. Read Crush It!, Jab, Jab, Jab, Right Hook, and The Thank You Economy. Listen to Gary and Shonduras talk about Snapchat on the Social Media Marketing podcast. What do you think? What are your thoughts on Gary Vaynerchuk’s videos? Please leave your comments below. 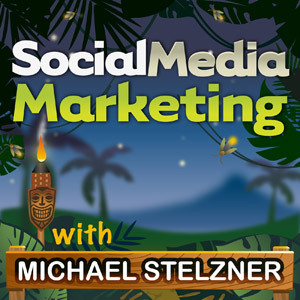 Gary Vaynerchuk talks with Michael Stelzner about how he created a video show that became an audio podcast and a book.